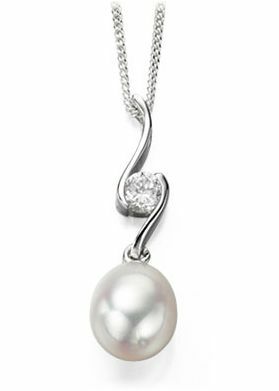 Shimering 925 Sterling Silver pendant complete with a with an unusual twist and sparkling cubic zirconia, which sits on top of a lustrous slightly oval snow-white freshwater pearl. Size: 26mm Threaded on a 925 41cm16" Sterling Silver Mirror box chain. Gift boxed.